My family of 5 just returned from a 2 hour sunset kayak trip with Jan Kretz AKA the Adventuress. We had canoed as a family but not done a group kayak tour previously. We picked Jan based on the fantastic reviews on this site. After some basic safety lessons and paddling tips we were off. 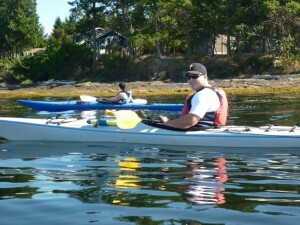 What an amazing experience to view the coast from the water, especially from the tranquility of a kayak. We paddled for an hour, watched the beautiful sun set, then meandered back. It was an absolutely stupendous way to end the day. Can't wait to go again!!!! Please call first to reserve. Since we do not have an on-water or retail location, we will meet you at a designated launch with the boats and gear depending on the tour you have booked. Please do not come to the address on Google as that is Adventuress’ office location and not open to the public. Please see your e-mail for directions to your particular launch location. We also deliver to some vacation rental spots in the Oceanside area if they border on a beach. We want to make sure you will be safe, so please do have kayaking experience before you rent… these ocean waters can be windy and wavy! Adventuress offers you the choice of a single or a double kayak. Double kayaks are longer and more stable and have two cockpits so you can paddle with a friend or a younger family member. Singles are a little more adventurous and you are the only captain of the ship! Updated wind, weather and tidal information to ensure your safety. These are West Coast waters and as such can be cold and wavy. The wind can come up and make for vigorous paddling or adventure as you see it! Adventuress advises first time kayakers to go out with a guide. Try our 2 hour Seaside or Sunset Paddle for $52 + gst/person or our 3.5 hour Mistaken Island Lunch Tour ($79). All tours includs a certified guide, your choice of a single or double kayak, all the Transport Canada gear, personal fitting in your gear and boat, paddle stroke instruction and safety talk and dry bags for your camera, extra clothes, etc. For client safety, everyone must know how to kayak and at least one person in the group must have taken a course in wet exits and rescues and feels confident enough to rescue a paddler should a capsize occur. Adventuress offers kayaking courses for those wishing to learn paddle strokes, wet exits, rescues and much more! Learn more here. Everyone will be asked to sign a waiver of liability and a kayak and gear rental form upon arrival (parents/guardians sign for children). Some age restrictions may apply. Note: Due to increasing gas and transportation costs, a $20 charge is added to the rental rate which covers the drop off and pick up of boats and gear per group.